What Is the Fitbit (NYSE: FIT) Stock Price Today? Subject: What Is the Fitbit (NYSE: FIT) Stock Price Today? The Fitbit (NYSE: FIT) stock price today closed at $29.68, down 2.4% from the $30.40 opening price. Last night, the Fitbit IPO priced at $20. That was above its $17 to $19 range. The deal raised $732 million. That means initial investors saw an immediate gain of 52% when FIT stock hit the market. The total number of outstanding shares is 36.6 million. Based on the opening price, Fitbit is valued near $6.3 billion, making it one of the most valuable consumer tech companies in the world. 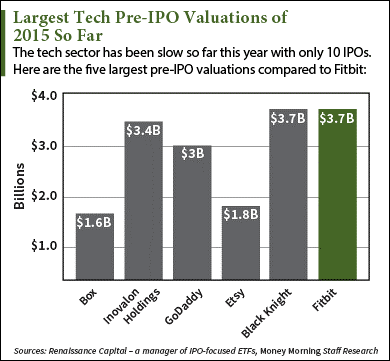 The Fitbit IPO is one of the most talked-about tech deals of the year. After all, Fitbit dominates 85% of the soon-to-be $19 billion wearable tech industry. If it follows the typical first-day pattern, the Fitbit (NYSE: FIT) stock price today will soar. Apple Inc. (Nasdaq: AAPL) and the Apple Watch will influence how the Fitbit (NYSE: FIT) stock price performs over the long term. The Apple Watch has fitness and exercise tracking capabilities, making it Fitbit's toughest competitor. Apple Watch sales estimates range anywhere from 8 million to 41 million units, with an average of 22.6 million. That beats Fitbit's total sales of 20.8 million by 8.7%. Fitbit noted in the "Risk Factors" section of its IPO filing how it faces stiff competition from Apple's overwhelmingly popular product. "We expect competition in our market to intensify in the future as new and existing competitors introduce new or enhanced products and services that are potentially more competitive than our products and services," the IPO filing noted. Wearable tech is expected to become a $19 billion market by 2018, and there may be enough room for both Fitbit and competitors like the Apple Watch. Since the wearable tech market is still in its infancy, it's hard to tell who will survive down the road. I will be live tweeting the Fitbit IPO on Thursday. Follow me at @AlexMcGuire92 for updates on any movement in the Fitbit (NYSE: FIT) share price.